I found this Captain Storm comic at a rummage sale for $1.25. I didn’t bargain. The date is 1965 and I would have been 12 and still into comic books like Sgt. Rock and Easy Company, Captain Johnny Cloud and his P-51 Mustang and Sgt. Fury and the Howling Commandos as well as other WW2 type comics. But Captain Storm I never heard of. The good captain was apparently the skipper of a PT Boat and since the comic was published in 1965 it’s easy to see that the inspiration for it most likely came from President John F. Kennedy who was the skipper of PT-109. Kennedy’s exploits were well-known to every school boy my age so it’s hardly surprising a comic with a Kennedy like figure would be on the market. Was JFK the inspiration for Capt. Storm? I think so. The story line is a two-parter. The PT-Boat is on a mission to sink a Japanese air craft carrier. To achieve that impossibility they first have to over come a series of obstacles that includes first sinking a Japanese destroyer which at least was a possibility. The Japanese are caricatures and not real bright while the Americans are heroic and resourceful. This is typical early sixties type stereo-typing that demonized our enemies. The last story in the issue has to do with the North African Campaign although the resemblance stops with the fact the story takes place in a desert. Four German Tiger Tanks, yes four, about 25% of the total Tiger tanks that were in Tunisia ambush a single American Sherman. The Sherman is surprisingly resilient and dispatches the first three Tigers and a Luftwaffe fighter for good measure before the final duel with the last Tiger. The German finally knocks out the Sherman and the German gives his enemy a salute for being so darn brave and effective. By the end of the story they must be in the middle of the Sahara because the German then quietly dies as the sand covers all. Even when a German wins he loses is the moral of the story I guess. 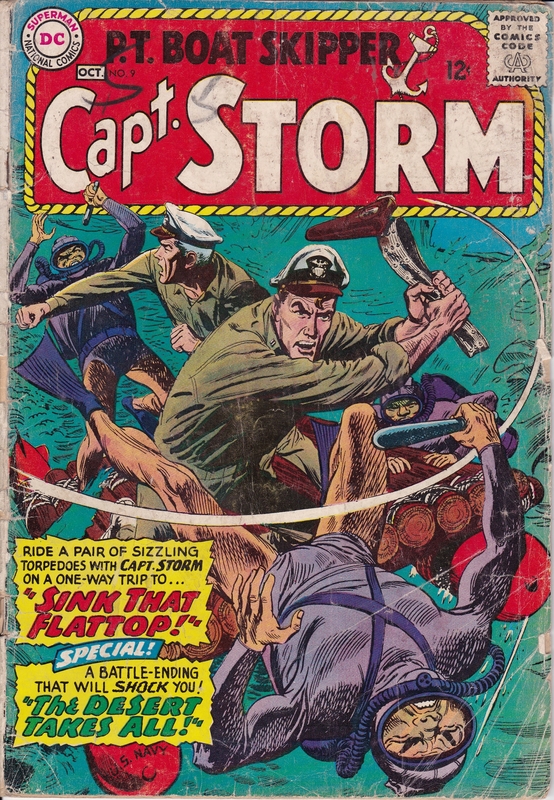 Captain Storm is 1960’s typical of WW2 type comic with American servicemen doing the impossible and the Germans and Japanese serving as foils and caricatures that every once in a while show a human side (Enemy Ace, modeled on the Red Baron in WW1 for example). By 1965 the US was knee-deep in the quagmire that was Vietnam and the reality of war was being broadcast nightly. Casualties were beginning to mount and the anti-war movement gained strength with every passing day. For those of us who grew up with Sgt. Rock, Sgt. Fury, Captain Cloud and Captain Storm the reality of war began to sink in and the comics lost appeal. The heyday of war comics was at an end and although some persisted into the seventies many became relics of a bygone time and found their way into someone’s collectibles or trash heap. I rescued one for $1.25. It took me down memory lane.